Bruce Charlton's Notions: What about crop circles? It is surprising how much information about crop circles I have gathered over the years - mostly because some of the people whose writings I enjoy for other reasons (such as John Michell) were also very involved in the crop circle phenomenon (Michell called himself a 'cereologist'!). Since all our 'external' knowledge (including all of science, and academic research) is based on reliable eye-witness reports, and several people whom I regard as reliable have reported strange crop circle phenomena; I am now happy to accept that there is 'something' mysterious about some crop circles. Most of the people I have encountered who write and speak on the subject are not convincing individuals by my judgement. Nonetheless some of them are; and because some such people are convincing to me, therefore (to put it negatively) I don't believe that the whole crop circle business is a hoax. 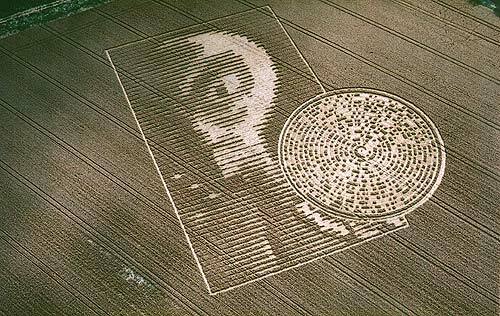 Positively stated - some crop circles have had a 'supernatural' cause - beyond mainstream possibilities. 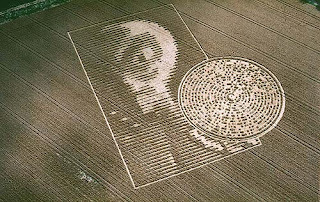 I believe crop circles are 'real' but trivial, in the same way that most 'mediums' who 'channel' spirits provide some information that may really be of supernatural origin, but which is trivial. Supernatural does not equal profound. Spiritual beings are real, but many of them (even among the broadly-benign) are foolish, conceited, ignorant - just like mortal Men. Supernatural phenomena may also be evil - indeed they usually are either evil or trivial; esepcially when they are deliberately sought-for, by 'techniques' or strenuous meditational practices. We ought not to be too impressed by such things, esepcially not by their specific content. Yet our cultural materialism has made us naive and credulous of almost anything we believe to be real that we find 'scientifically' inexplicable. This is supernaturally equivalent to believing something simply because 'a bloke in the pub' told us; or because we 'read it in an old book'. Over more than thirty years - before and after I became a Christian; my ineradicable conviction is that any spiritual being, or alien visitor, who uses shapes flattened into corn to 'communicate' with humans, when these shapes are enigmatic and can only be seen from the air, must be either crazy or joking! Of all the possible ways to communicate, this has to be one of the silliest imaginable. The other problem for me is that corn circles are a material phenomenon inviting a materialist explanation; so that they are probably not a good way of inducing people to acknowledge the reality of a spiritual realm. Nonetheless, there are example of corn circle fascination having served as a kind of 'entry drug' for some people. It gets them out into the countryside to experience things for themselves; makes them suspect the validity-of, and eventually learn to ignore, the mass media; it widens and opens their thinking. It is more possible that such a person may eventually come to Romantic Christianity, than someone who is locked-into the media-bureaucratic mainstream evil virtual reality. So - while trivial in themselves; for such people, although not for me, crops circles have had a value. Yet even so I am suspicious of the kind of value - in that sense that even when the speculations about crop circles are not simply materialistic (after all, technologically advanced aliens intervening in the earth using powerful forces or floating balls-of-light are just an extension of mainstream Western scientistic positivism); the focus on the abstract implications of abstract patterns printed on fields is (I believe) not what is required for the healing and progression of modern Man. What is needed (by my understanding of things) is a recognition of reality as consisting of living, conscious beings with whom we may have direct (unmediated, not indirectly communicated) relationships: a kind of 'conscious animism' in the context of a Christian metaphysics. By contrast, a spirituality of expert investigators technically unravelling enigmatic geometry, binary codes, fractal shapes and mathematical relationships is pretty the opposite of what I would most wish to see - of what we most need. If the above remarkable formation - consisting of a stereotypical alien, and an ASCII-coded message to Mankind - is genuinely of supernatural/ extraterrestrial origin... it proves my point about the kind of beings that are involved! This is exactly the conclusion I have come to about crop circles. My parents lived in Wiltshire and in the '80s and '90s when I visited them there were often reports of crop circles nearby. I went to see some of them and they are intriguing. Some of them are beautiful but they are also essentially meaningless. If they are of supernatural origin,and I don't doubt some are, the beings responsible are not of an elevated character. For me the most interesting thing about them was the regions in which they appeared. I believe these regions are places where the veil between this world and the next is thinner than elsewhere and this facilitated the appearance of these designs. Maybe they did serve as a wake up call in some respects but you had to move on from them quite quickly since in themselves they have nothing serious to say. @William - Glad we agree on this! - you obviously have direct experience of the phenomena, which I don't. I've been living many hours travel away from the major areas since they emerged. "the most interesting thing about them was the regions in which they appeared. I believe these regions are places where the veil between this world and the next is thinner than elsewhere and this facilitated the appearance of these designs." I have seen maps that suggest the formations usually appear on chalk hills - e.g. http://www.journeyswithsoul.com/imagesnew/g9345678.jpg . But then, these chalk hills seem to have been particularly important to our Neolithic and early Bronze age ancestors, who left behind much evidence of their ritual activities plus there are the major 'ridgeway' tracks. My hunch would be that it is the history and continued presence of (apparently) 'sky worshipping' circular temples such as Avebury, Silbury and the many others - which seem to have made a complex network across this whole area; which may have left some kind of 'thinning' of the veil? It may be a phenomenon more like ghosts than anything of religious significance - if (as appears to be the case) ghosts are found in undisrupted sites (eg persisting buildings) where some intense event happened. That's a good point. The ones I saw were indeed around the Avebury area since my parents lived just outside the town of Calne which is in that area. I do feel there is some kind of connection between prehistoric sites and crop circles and you may have identified what that is. You can definitely still feel something otherworldly in these places. My hunch is these are all man made. However, if they're not, why couldn't the aliens be communicating amongst themselves? "Hey Bill, this is a great spot for some chalk dust. Over and out." @ads - The main reason I think they are not all man made (aside from the implausibility that a hoax craze would have continued for so many decades) - is the speed with which some large/ complex designs have happened, appearing within a very few hours (or less) and at night. In the end, this discrepancy relies upon the honesty and reliability of the eye-witnesses, which I can't know for sure; but some seem like solid people.